Configure IT provides a feature to set specific Work Flow. It allows you to set workflow without navigating individual module. You can directly do specific action one by one. You need to configure workflow for that. Go to Workflow management, it will show you below workflow listing screen. Delete : allows you to delete workflow. Active : allows you to change status (Active) of selected workflow. Inactive : allows you to change status (Inactive) of selected workflow. Show All : shows you all workflows in listing. Search By : allows you to search any workflow by workflow name / code / status. Now we will see how to add workflow & its configurations. Click on Add New button and you will be redirected to workflow detail page. For Example: Let’s create workflow for adding country and state without navigating individual country and state module. No need to navigate to state module for adding state of added country. Workflow Name : allows you to specify workflow name. Workflow Code : automatically takes function name based on workflow name. 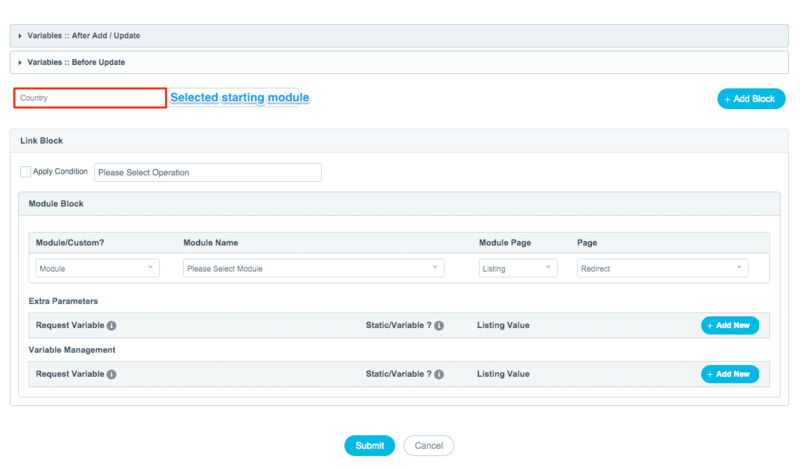 Starting Module : allows you to select module from which work flow will be started. Select Starting module of your work flow. Flow Module : allows you to select module for further flow. You can set multiple modules for further flow. Global Variable : shows you global variables which are used in flow. Variables which are used in variable management section in configuration page, will be treated as global variables. You can use global variable throughout the flow. Comments : allows you to set any comments for your future reference (information purpose only). After adding details , just update and next , you will be redirected to workflow configuration page. It will show you default screen of workflow configuration page where you have to configure whole work flow. See below default screen for workflow configuration. Here , It will show you variable details. Just for your reference if you want to use it in flow. 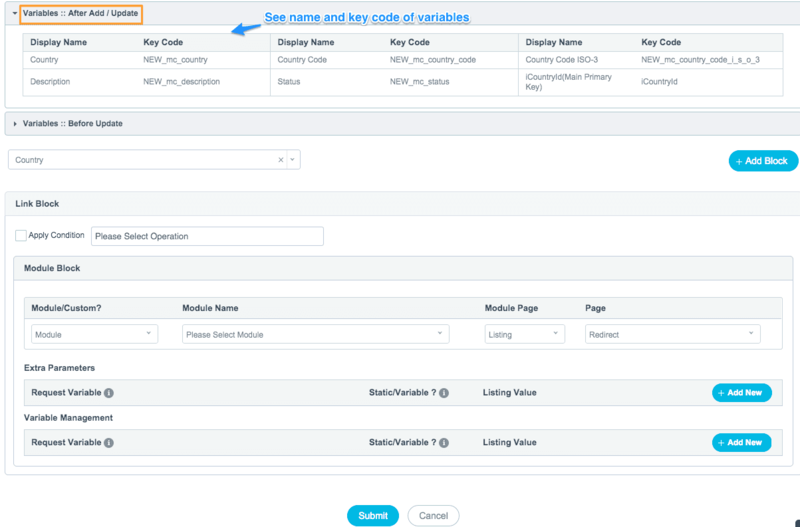 When you click on it , it will show you variables details (Variable name and key code). The variables which you can use after add/update. If you want to use any variables then you can map it with key code of specific variables. 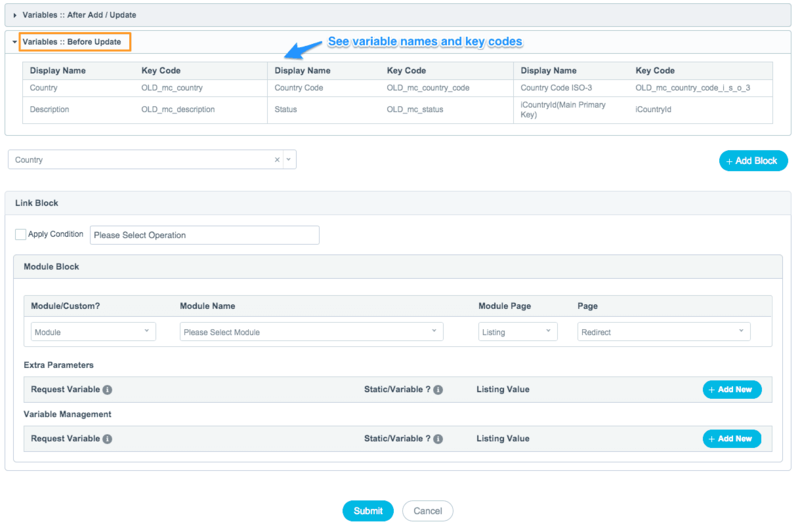 When you click on it , it will show you variables details (Variable name and key code).The variables which can be used before update. If you want to use any variables then you can map it with key code of specific variables. Here , It allows you to select operation , module redirection on specific page with request variables , apply condition. Apply Condition : It allows you to add condition. When you select apply condition, condition block will be added in link block where you can set condition , add more condition by AND / OR. Operations : It allows you to select operation (After which action , module will be invoked which you will configure for flow). After Add : after adding record from Add form. After Update : after updating record from update form. After Inline Edit : after editing record through inline editing. After adding country , module will be redirect directly to “Add State” page. Country is starting module. Now we have to configure flow module in ‘module block’. See below screen where we have configured flow using state module. Here, we have defined “state” module. Page will be redirected to add page of state module after adding / inline editing of country module. Module Block : It allows you to add module in workflow. It allows you to select created module / custom module. Here, you can navigate module directly to specific module page (Listing / Add / Update) using page redirect/reload. See state module settings in module block. Extra Parameters : It allows you to set multiple extra request parameters. You can set different types of params here. Variable / Static / Function / System / Server / Session / Request. Just map with the listing value. Same thing you can do for “variable management” block. Just submit and you will be redirected to workflow listing page where you can see workflow name , workflow code , status and navigational link of detail and configuration page. Now go to Add / Update section of State module in admin management. You have to set request parameter for country dropdown that we have defined country_id in workflow configuration module block. Field level settings of Country field , set request parameter and save settings. Now just update code from admin management section and new window will be opened of admin panel. Add records of country and you will be redirected directly to add state of added country (added country will be selected in country dropdown). Navigate from “add country” to “add state”. After saving country record , it will show you add form of state module with selected “demo country”.